· Improving your products: Whatever your product may be, using recycled materials and fewer toxic and chemical ingredients can produce less waste that is less harmful to the planet and people in your community. · Improving your process: Improving your practices, whether it be through recycling or saving energy implementation, can save your company money. In addition to boosting energy-efficiency within your small business's strategies, there are also ways to achieve this in the surrounding community. First, if your business uses vehicles for work purposes, you can choose more fuel-efficient transportation methods. Second, you can shave energy use by hiring local vendors that can more quickly and easily work alongside you. Using more technology and online services can do wonders in reducing physical waste. Not only that, technology can boost your business in other ways. A large example is with digital marketing. Combined with marketing that educates about recycling and proper disposal purposes, you can successfully bring attention to both your business and well-meaning practices that benefit planet Earth. These types of efforts will help keep the planet clean and free of chemicals and unnecessary waste. At the end of the day, environmental sustainment is not only good for the future, but it is increasingly better for business. 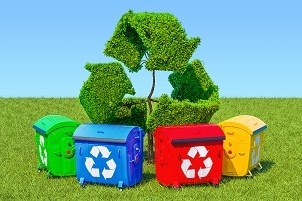 Improving such things as waste management is a proper first step for small businesses to “go green.” With the above tips in mind and the help of local Reed City, MI, dumpster rentals, you'll be on your way to building a better future for you and your business.